As an active co-operator I am proud to be the Vice-Chair of Scotmid Co-operative's North Regional Committee. As part of that role I was pleased to get along to Blackness Primary School in the West End today to help the Royal Highland Education Trust (RHET) deliver their 'Shake-up your Wake-Up' Farmhouse Breakfast Week event. 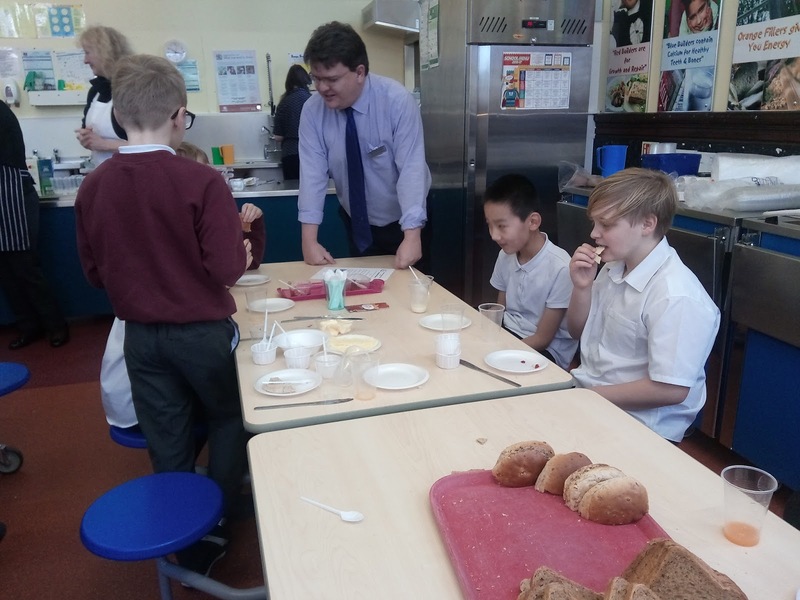 Today Primary 6 had the chance to hear about where the food they eat really comes from, that is not the supermarket or even the local Scotmid but from farms. The young people also had the chance to try some excellent local Scottish produce. They also learnt about the idea of food miles, and discussed how it was a good idea that these were kept to a minimum. I also had the chance to see if my waiting skills, learned whilst a student, had left me. 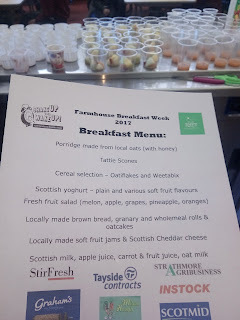 I really enjoyed myself and it was great to see young people try things that they hadn't tried before like porridge or rhubarb yoghurt. This was an excellent event - well done to the RHET and their sponsors including Scotmid. I think linking our farms and our agricultural and food businesses with consumers is important. As regular readers will know I am a champion of Fairtrade and I think that this is linked because I think that we should all have an interest in where our food comes from whether that is oats and berries grown in Angus or Perthshire or oranges and bananas grown in Africa or South America. It was also great to visit Blackness Primary School today and see the great work which is going on there and to meet the very well-behaved Primary 6 class. I welcome movement by Dundee City Council on car parking in the West End. I seconded a motion that would have seen action by the Council, this was withdrawn after the council agreed to broaden the remit of the working party which is currently looking at the Perth Road District Shopping Area. It was good to hear local people make the case about the need to deal with car parking issues in the West End at the meeting. I am pleased that the council eventually agreed to take some action with regard to car parking in the West End. I supported the council looking to take action in the West End because as a local councillor and local resident I know that this is a huge issue for local people. It impacts on people's quality of life and on the economic activity of the area. Car parking is clearly a big issue in the West End. A few recent surveys have pointed out that this is the case, such as the one undertaken as part of the consultation on the future of the Perth Road District Shopping Area. It is an issue that is raised with me time after time. I am not making the case that there are no car parking issues in other parts of the city. There are, and especially in parts of the city that like the West End border, or indeed include, the city centre, like the Maryfield Ward and the Coldside ward. When the people of the West End rejected the previous Resident’s Parking scheme they were told that this was not the end of efforts to improve car parking. Since then nothing has happened. I am clear that there are issues on Roseangle and Magdalen Yard Road and in the Perth Road lanes and that there are issues even up to Blackness Avenue and the roads off it. One size does not fit all and we need to look at ways of dealing with some of the car parking issues in the area. I am clear that one of those is dealing with our reliance on car, and I include myself in that. We should be looking to bring forward solutions tailored to local needs. To do this the council needs to listen to the views of local people. I know that there is not an easy solution to these problems but neither is the solution to say that we will do nothing. I hope that the council will listen to the people of the West End. It is good that a forum for discussing this has been found and I want local people to send me their parking issues. I want to go to this meeting with as full a picture as possible of the issues in the West End. I hope that the compromise which has been found tonight will lead to results, but I will be watching closely. We do need to talk about the issues but we also need to take action sooner rather than later. So, I want to see progress soon.